Senior Michaelah Wise finished her high school golf career scoring 94 for a two-day total of 180. Michaelah opened her first four holes of the morning one over par. “Michaelah started really strong, her putting stroke was really smooth,” said Coach Dommel. Then Michaelah hit a stretch where the yardages were not what was anticipated off the tee box and struggled finding her full swing causing her to really scramble Michaelah worked hard to post a 50 on her first nine holes. Her second 9 holes – the front 9 of Mid-Carolina Country Club, was more comfortable for Wise. “Michaelah has always represented our school with a great class and demeanor. She has been to the State Championships for the last three years. 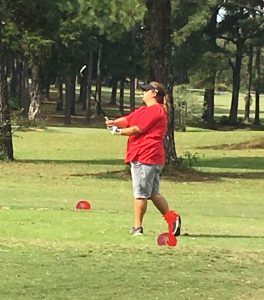 Our team has always had Michaelah as our number one and we are going to miss her reliable golf performances,” said Coach Dommel. Michaelah wrapped up the second 9 holes with a 44 for a total of 94.